Why is our GEL Keratin Lash Lift better than any ordinary lash lift? Regular lash lifts curl only from the middle of your lash, giving the same average effect as an at-home lash curler. Our special GEL Superboost curling technique lifts from the very base of your lash root, giving you the ultra-dramatic look you can only get with a GEL Lash Lift. Regular lash lifts use the same perming solution used to perm the hair on your head. This solution is too harsh and ends up “frying” (damaging and breaking) your eyelashes because your eyelashes are finer than your hair. GEL Keratin Lash Lifts use a gentle, medical-grade lash botox formulated only for eyelashes. It is made of 97.7% organic ingredients including keratin, silk peptides & botanicals. It’s not only safe for your lashes but actually healthy for them! When paired with our GEL Keratin Mascara, our lash lift is like the ultimate hydrating lash mask. It willrepair brittle & broken lashes and help short lashes grow longer with every treatment. We are one of only 4 studios in all of Canada certified to offer the GEL Keratin Lash Lift—and the only one in Canada to specialize in it. Book online to experience the GEL Keratin Lash Lift for yourself. You literally wake up like this. This is not like ANY other lash lift. 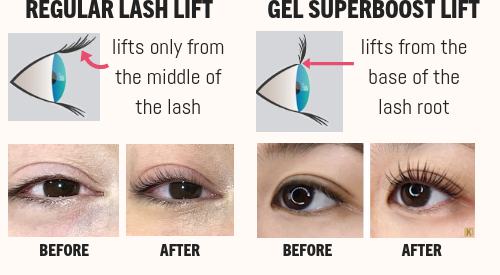 Still not sure if the GEl KERATIN Lash Lift is right for you?